Mi Tierra is the finest Mexican circus in the U.S. 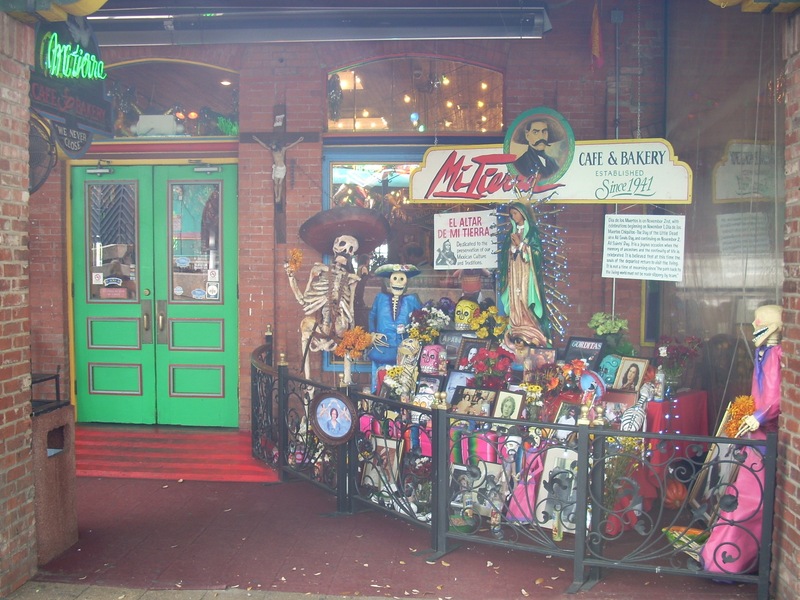 There's a bakery (above left), candy shop, gift shop and bar (above right), all inside a building with this charming Day of the Dead display at the entrance (right). Each of these attractions is worth a stop and a quick photograph. The whole menagerie is open 24 hours a day seven days a week and usually has a lively crowd. Every room is a colorful mix of light strings, holiday decorations, Mexican artifacts and wall hangings. 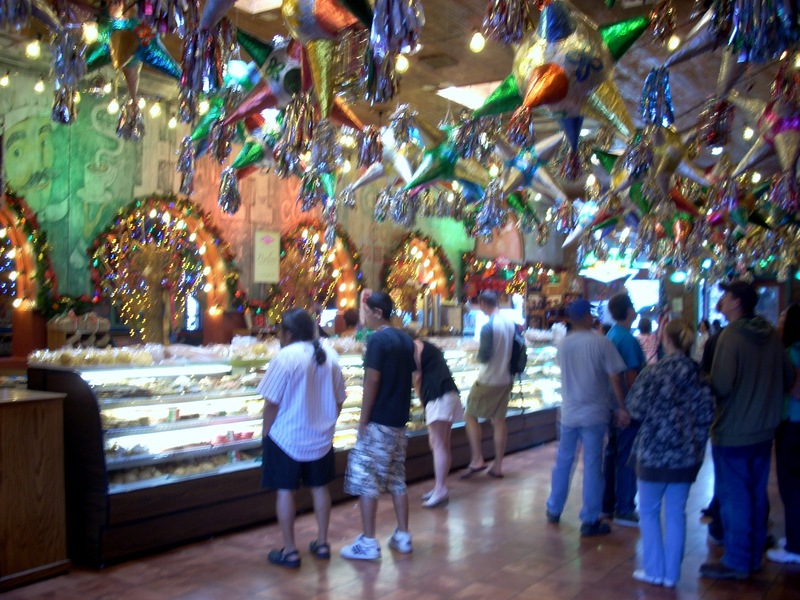 It carries the festive atmosphere of El Mercado to its logical extreme. But the heart of it all is the restaurant founded long ago and still run by the Cortez family. We recommend Mi Tierra for lunch on your day at the Mexican Marketplace, so we'll focus here on the lunch menu, but it also makes a fine dinner, or even breakfast, stop. Among appetizers, we particularly recommend the Botana Platter. Every Mexican restaurant in Texas offers this item, but they all do theirs differently. 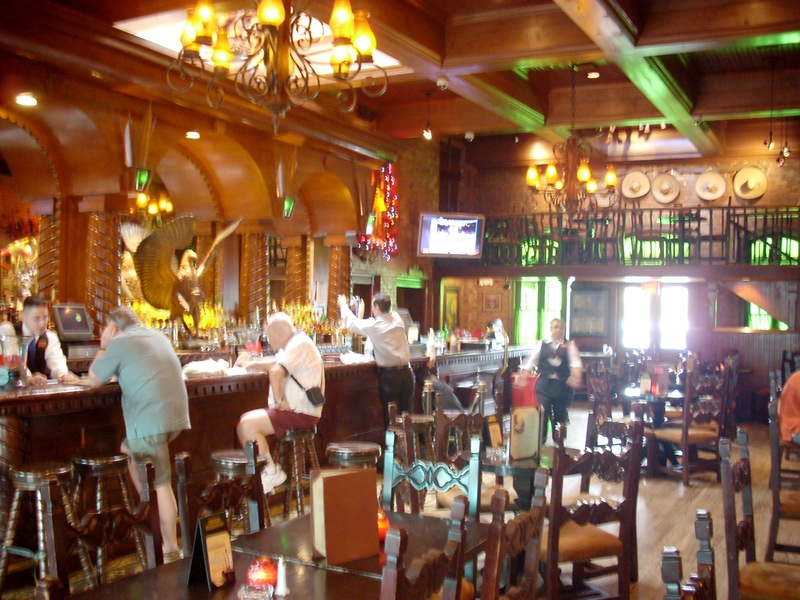 Mi Tierra's includes an assortment of miniature Flautitas de Pollo, cheese quesadillas and chalupitas de Picadillo, served with Guacamole and sour cream. If you're really hungry, one of their soups makes a great lunch. 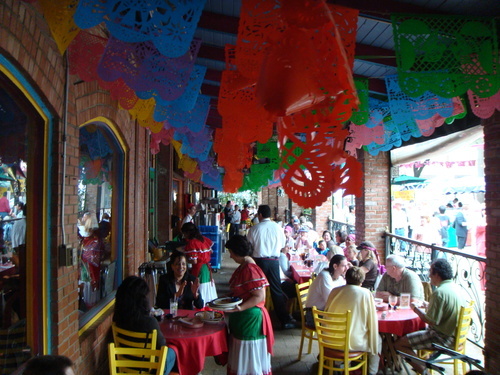 There are three : the Caldos Caseros (homemade vegetable soups with beef or chicken), and Del Mercado (the traditional chicken tortilla soup offered by most Mexican restaurants). These are very filling soups and for most people an appetizer plus this soup is a complete lunch. But there's a whole page of lunch items, which includes a daily lunch special. This is the only place at Mi Tierra's Chile Rellenos are listed. If the Pollo con Calabacita y Elote is available the day you're there, order it. This is a baked chicken sauteed with squash and fresh yellow corn, served with Spanish rice and refried beans. If not, try the Pescado El Mojo de Ajo. It's grilled fish in garlic sauce, served with enchilada ranchero de queso acapulo, Spanish rice and salad. Or check on the Tacos de Pescado, which is two tacos of lightly breaded white fish sauteed in chipotle sauce, topped with cabbage and avocado, served with Spanish rice and frijoles al a charra. There are other fish items at Mi Tierra's, but they're all fried, and we subscribe to the mantra of our mentor, Gusto Cuisine, who admonishes, "Frying destroys food. You don't taste the food. You only taste the frying." You can order desserts off the lunch menu, or you can stop by the bakery and order the Candied Sweet Potato or one of their other obscene treats. You'll need that long walk back to the hotel.